The ‘Young European Ambassadors’ initiative is a driving force of the ‘Young European Neighbours’ network, created by the ‘EU NEIGHBOURS east’ project. The role of the Young European Ambassadors (YEAs) is to connect the youth from the European Union and the Eastern partner countries (Armenia, Azerbaijan, Belarus, Georgia, Moldova and Ukraine). They exchange experience, discuss matters of direct concern to young people, share best practices and experiences and work together for a better future. Nearly 500 young people from the EU Member States and the Eastern partner countries have been appointed to date as ‘Young European Ambassadors’, based on applications received by ‘EU NEIGHBOURS east’ in August of 2016, 2017 and 2018. New calls for applications will be open on an regular basis. The Young European Ambassadors regularly participate in dialogue-driven activities and engage online on a daily basis through the 'Young European Neighbours' network Facebook group. Download the latest handout on the network here. Read the Young European Ambassadors' stories here! Get to know the Young European Ambassadors here! The Young European Ambassadors regularly participate in dialogue-driven activities and engage online on a daily basis through the 'Young European Neighbours network' Facebook group. The year 2019 marks the 10th anniversary of the Eastern Partnership (EaP) and in order to celebrate the successes of what has grown into a vibrant, modern and creative partnership, the 'EU NEIGHBOURS east' project - in close cooperation with, and under all guidances by DG NEAR and EEAS StratCom East Task Force - organised a two-day event which took place in Brussels on 14-15 February. The ‘EaP 10th Anniversary Launch Event’ gathered nearly 100 young leaders from the Eastern partner countries and the EU Member States, among which 74 were Young European Ambassadors, to celebrate this milestone with a flash mob, national costumes, flags, music, art and dance. It was a unique opportunity to engage in direct dialogue with high-level EU officials, including the Valdis Dombrovskis, the Vice-President of the European Commission, to network and to brainstorm ideas for future engagement for the Young European Ambassadors at the local, national, and regional scale. Ahead of the launch event that took place in Brussels, the Young European Ambassadors organised flash mobs in each Eastern partner country with traditional costumes, music and choreography. Read Vladislav's and Esma and Anderik's story on their participation in the EaP 10th Anniversary Launch Event. In December 2018, the Young European Ambassadors from across the region organised a number of actions in dedication to Human Rights Day that revolved around creative dialogue-driven activities aimed to raise awareness about the need for the protection and promotion of human rights and the role that the European Union plays in their protection in the region and directly engaging with local communities by reaching out to local schools, youth organisations and NGOs. In Azerbaijan, the Young European Ambassadors organised two activities related to people with disabilities in dedication to Human Rights Day - a "Young Master Chefs" cooking class and a "Break the Stereotypes" workshop. They chose to organise this activity in order to highlight the societal issues relating to the stigma against disabled people, specifically disabled youth, in their country and the need for their improvement in this area. The first activity, the "Young Master Chefs" cooking class took place on 1 December and was organised by the Young European Ambassadors for young children hearing disabilities at the Suldan Food Centre in Baku. Throughout the day, the young chefs individually prepared, designed and baked their pizzas according to their own creativity and taste and played and drew pictures with the Young European Ambassadors. Watch the video for the ‘Young Master Chefs’ cooking class here! For the "Break the Stereotypes" activity, which took place on 4 December in Baku, the Young European Ambassadors in Azerbaijan delivered a workshop to young people with disabilities, as well as youth trainers who work with disabled children on a daily basis. Through fun ice-breaking games coupled with informational sessions and little quizzes for the workshop participants, the Young European Ambassadors were able to connect with local youth in a close and informal way, allowing for a great exchange of ideas and practices surrounding the topic of (discrimination against) disabled people and disabled youth in Azerbaijan. On 8 December, the Young European Ambassadors in Georgia visited the Euro-Atlantic Club "Surioni" in the Vani Orthodox Gymnasium, named after St. Nino. The Young European Ambassadors had previously were previously invited by the Metropolitan of Vani and Bagdati, Antoni (Bulukhia), to present the 'Young European Ambassadors' initiative and speak about opportunities offered by the European Union to young Georgians. Throughout the event, the Young European Ambassadors cooperated with the Metropolitan of Vani and Bagdati, Antoni (Bulukhia) and Archpriest Petre (Giorgadze) to highlight the crucial role that young people play in raising awareness about the European Union and our shared values among their peers. To underline this point, the Young European Ambassadors shared their own experiences in and how they personally benefited from one of the many EU programmes and youth opportunities with the Euro-Club members. They spent the day in dialogue, exchanging ideas, experiences and best practices amongst each other. In Moldova, the Young European Ambassadors launched a successful event format on 8 December entitled "iTalkEurope", in which they invited six speakers with personal background and experience in one of the many EU grants and programmes offered to young Moldovans. The event gathered a group of young locals in a café in Chisinau to present and discuss the importance and personal benefit to be drawn from academic and intercultural exchanges offered through the European Union. In Ukraine, the Young European Ambassadors came up with an ambitious project. Over the course of six days between 8 and 13 December, they travelled to five cities across Ukraine (Chernihiv, Dnipro, Cherkasy, Kharkiv, and Ostrog) to meet with local youth for five different events aimed to educate and engage local youth with the European Union. Through fun ice-breaking games coupled with informational games and workshops, including EU quizzes about its history and structure, EU simulations, roundtable discussions and debates with experts, the Young European Ambassadors highlighted and discussed the topics of freedom of speech, human rights, anti-corruption, sexism, and gendered education and, of course, the European Union. On 15 December, the Young European Ambassadors in Armenia visited the 'Aregak Bakery and Café' - the first inclusive Café in Gyumri, offering employment to several local disabled people. They chose this location as they thought it was a perfectly suited example to highlight the importance of human rights and the protection of human dignity. In order to stimulate a fruitful discussion around the topic of human rights, the Young European Ambassadors prepared special portable coffee cups imprinted with special messages containing facts and figures about human rights, as well as a QR-code that directly forwarded the customer to the online publication of the Universal Declaration of Human Rights. Over the course of the day, the Young European Ambassadors offered free coffee to all the customers of the café and engaged in many conversations and discussions about human rights with local villagers and youth. Read Areg's story about his experience speaking about human rights over a cup of coffee. In November 2018, the Young European Ambassadors from Georgia were invited to present the 'Young European Ambassadors' initiative, the European Union, our shared values and its opportunities for youth in 'Young Farmers Centres' run by the Association Rural Development for Future Georgia (RDFG) under the ENPARD funds. These 'Young Farmers Centres' father young people to empower and encourage them with the necessary skills to play a more active role in their local communities. The Young European Ambassadors previously met members of the 'Young Farmers Centres' during the Wine Harvest Festival, which took place in Kharkheti in October 2018. Following an exchange of details, they kept in touch with the aim to organise future events together, which in November 2018, the following month, became a reality. Over the course of five days between 12 and 16 November, the Young European Ambassadors teamed up with members of the 'Young Farmers Centres' to visit ten 'Young Farmers Centres' in the Tetritskaro Municipality in Georgia to educate and engage with the young members and promote the message that we are #strongertogether. Read about Esma's experience visiting Young Farmers Centres across Georgia! On 29 September, the day of the traditional Georgian wine harvest festival "Rtveli", the Young European Ambassadors in Georgia helped a local winemaker by harvesting his grapes in the village of Asureti in Tetritskaro, Georgia. For this activity, the Young European Ambassadors joined forces with members of the 'Young Farmers Centres' in Tetritskaro, an initiative supported by the European Union through ENPARD Georgia and run by the Georgian NGO "Association Rural Development for Future Georgia - RDFG" to encourage and support the skills development of young people in rural regions in Georgia. Through ice-breaking games and the exchange of experience and information, the Young European Ambassadors learned about the history and tradition of winemaking and connected with the members of the 'Young Farmers Centres' for close future cooperation. After two successful editions of the EU-focused summer school in Azerbaijan in August 2016 and 2017, a third edition of EuroSchool took place between 29 and 31 August 2018 in Qalaalti, Shabran, Azerbaijan. As in previous years, this summer school was jointly organised with the Delegation of the European Union to Azerbaijan and brought together fifteen young Azerbaijanis for the opportunity to participate in a series of interactive learning sessions, direct dialogue exercises and social activities to learn more about the European Union and its partnership with Azerbaijan. Over the course of three days, participants interacted with one another through learning sessions on the history and structure of the European Union and its Neighbourhood, our shared values, as well as opportunities open to young Azerbaijanis through the European Union. Among the eight trainers that oversaw the workshop sessions, educated and engaged with the young participants were two Young European Ambassadors - Ilyas from from Azerbaijan and Stefania-Felicia from the European Union (Romania) - who shared their experience of living, working and studying in the European Union. One of the main topics of interest to the participants was Erasmus+ and the personal experiences and lessons learned that Ilyas and Stefania-Felicia spoke about. Finally, through fun cultural activities, including an early morning hike to the top of the mountain behind the hotel and a group bowling night, the participants were given the chance to come closer together as a group, network and learn from one another in a truly immersive summer school experience. In June 2018, the Young European Ambassadors from across the region organised a number of actions in dedication to World Environment Day that aimed at raising awareness the environment and its need for protection. In order to do that, each country group of Young European Ambassadors organised themselves to plant either trees or roses in an area they deemed in need of (further) environmental protection. They did not do so alone - in order to raise awareness also among local youth on how they can get involved in environmental protection, the Young European Ambassadors reached out to local schools, youth organisations and NGOs to help them plant the trees and roses. Overall, they managed to plant over 100 roses in Georgia and Moldova and over 110 trees in Armenia, Azerbaijan, Belarus, and Ukraine. In his story, Titan, a Young European Ambassador from Armenia, explains why the protection of the environment is so important to him and the Young European Ambassadors. Throughout May and June 2018, the Young European Ambassadors in Moldova were invited to contribute to Europe Day activities organised in coordination with the European Union Delegation to Moldova across the country - Chisinau (12-13 May), Ungheni (19 May), Hîncești (20 May) and Soroca (2 June) - between 12 May and 2 June 2018. In each city, the Young European Ambassadors organised made an effort to connect to the local youth present at the Europe Day celebrations by inviting them to take a EU quiz (the winners received certificates! ), read and discuss the many informative handouts and ask questions, share photos on social media with fun signs and cutouts accessible to the everyone, and take a little giveaway from the Young European Ambassadors. 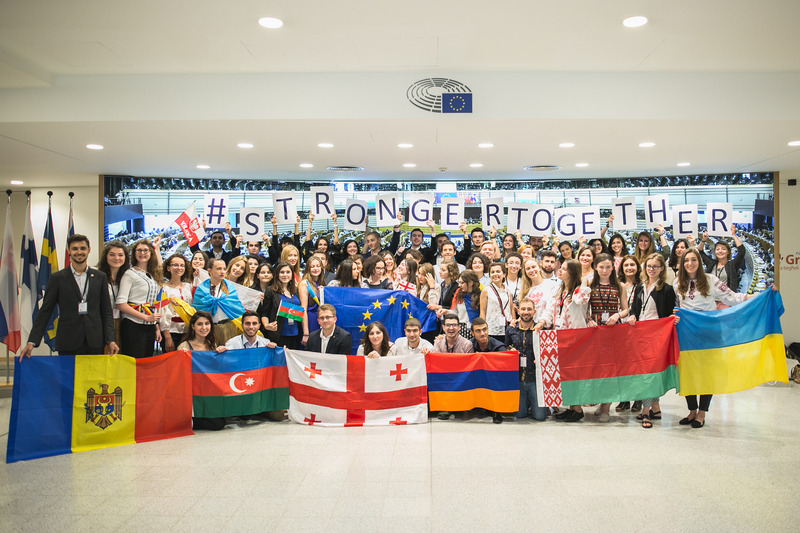 Between 22-24 May, six Young European Ambassadors from Armenia, Belarus, Georgia, Moldova, Ukraine and Austria participated in the 'EU Conference on Youth, Peace and Security' organised bt the European External Action Service (EEAS) in partnership with the United Nations and various civil society organisations. The event, held at the European Parliament in Brussels, brought together young peacebuilders working with the EU, representatives from EU institutions, EU Member States, UN entities and other multilateral and non-governmental partnership with the aim of fostering EU policy on youth, peace and security and promoting EU-UN cooperation in youth peacebuilding. The delegates met and exchanges views with key EU policy-makers, including European Parliament President, Antonio Tajani, the EU High Representative for Foreign Affairs and Security Policy, Federica Mogherini, and the EU Special Representative for Human Rights, Stavros Lambrinidis, as well as further UN, OSCE and youth representatives. One major highlight of the conference was that Levan Kutashvili, Young European Ambassador from Georgia, was selected to participate as a speaker in Panel II of the event, "Young people innovating for peace" where he shared his views on institutional best practice in the field of communication, providing examples of his experience as an IDP from Akhalgori. Another major highlight of the conference included the participation of Ani Khachatryan, Young European Ambassador from Armenia, and Philipp Brugner, Young European Ambassador from Austria, in the closing session with EU High Representative for Foreign Affairs and Security Policy, Federica Mogherini, in which they shared their views on peacebuilding innovations driven by young people and success stories within the 'Young European Ambassadors' initiative. Read Veronika’s story on her participation in the event! On 17 April, the Young European Ambassadors from Moldova traveled south to visit the city of Cahul, meet with local youth and participate in a public lecture held at the University of Cahul by the European Commission Director for the EU's Eastern Neighbourhood, Lawrence Meredith. The Young European Ambassadors engaged in direct dialogue with many university students, speaking to a total of over 100 students, introducing them to the 'Young European Ambassadors' initiative and sharing experiences as beneficiaries of EU youth programmes and opportunities, like Erasmus+ and EU4Youth. Six Young European Ambassadors from the Eastern Partner countries participated in the launch of the new EaP Cooperation event in Brussels on 12 March. They got the opportunity to ask questions and discuss with EU officials about the future of EU- related communication with youth of their countries. One YEA was interviewed by the Azerbaijani local media outlet Eurasia Diary, which resulted in an online publication accessible here. Over a period of one week, the Young European Ambassadors participated in workshops with EU officials to coordinate joint action, attended training sessions to enhance their communication, coordination and outreach skills, organised a school visit in the Tserovani IDP settlement and a university visit at Tbilisi State University to raise awareness about the EU-Georgia partnership, as well as participated in an interactive roundtable with local organisations active in the field of youth and EU communications to share best practices and explore avenues for cooperation. See all photos from the visit here. After a successful first edition of the schools visits across the Republic of Moldova, a second edition of the ‘Young European Ambassadors’ visit’ took place between 30 October and 17 November 2017. This dialogue-driven and interactive activity was jointly organised by the Delegation of the European Union to the Republic of Moldova and the ‘EU NEIGHBOURS east’ project in the framework of the ‘Young European Neighbours’ network. The network, launched in 2016, covers the EU Member States and the six Eastern Neighbourhood countries: Armenia, Azerbaijan, Belarus, Georgia, Moldova and Ukraine. Over three weeks, 27 Young European Ambassadors visited 20 high schools across the Republic of Moldova and reached over 2,500 pupils through interactive presentations on the EU’s origins, our shared values, its main institutions, its partnership with the Eastern neighbourhood, especially the Republic of Moldova, as well as the opportunities it offers to young Moldovans. In each school, a workshop was also organised to prepare pupils for the ‘civic engagement initiative’ contest organised by the EU Delegation to Moldova. Read Carolina's story about the visits here. Between the 23rd and 26th October 2017, six Young European Ambassadors (YEAs) from Armenia, Azerbaijan, Belarus, Georgia, the Republic of Moldova and Ukraine participated in the EU Youth Conference in Tallinn, which gathered over 260 young people from all over Europe. Organised by the Estonian Presidency of the EU, the conference focused on brainstorming ideas for the launch of the 6th Structured dialogue ‘Youth in Europe: what’s next?’, which will inform, in the long-term, the proposal for the next EU Youth Strategy beyond 2018. Read Ani's story of her participation here. Three Young European Ambassadors participated in the EU Study Days Forum in Kyiv, Ukraine organised by the Delegation of the European Union to Ukraine on the 28th and 29th September 2017. They delivered an interactive presentation to raise awareness about the EU's partnership with Ukraine and our shared values, give concrete examples of the EU’s impact on the daily life of people, as well as promote the ‘Young European Neighbours network’. The EU Study Days Forum featured the participation of about 200 young Ukrainians, officials from the EU Delegation, as well as speakers from the Ukrainian government, NGOs, universities, projects, etc. Read the article published by Kateryna in the Ukrainian media outlet Espreso here. Between the 21st and 29th September 2017, Young European Ambassadors from Azerbaijan and the European Union visited schools and universities in Azerbaijan to raise awareness about the European Union, EU-Azerbaijan relations and the wide range of EU-related opportunities available to young people. The activities took place in the framework of the EU Bus Tour and the Baku school visits organised by the Delegation of the European Union to Azerbaijan. Between 21 and 24 September, three local Young European Ambassadors met students at universities in Zagatala and Sheki on 21 and 22 September respectively, where they conducted training sessions on the EU, its history, structure and values and shared their experience as beneficiaries of various youth opportunities. They also participate in the ‘EuroVillage’ in Sheki on 23 September by running an ‘EU Quiz Competition’ and interacting with members of the public face-to-face. Between 25 and 29 September, a group of six YEAs from Azerbaijan, Germany, the Netherlands and Romania met pupils and conducted the interactive training sessions and EU Quiz competition at six high schools in Baku. During this period, they also got a tour of ADA University and attended the closing ceremony of an EU-funded project. Read Nuriyya's story of her particpipation in the EU Bus Tour and EuroVillage here. After a successful first edition of the EU-focused summer school in Azerbaijan, a second edition of the EuroSchool took place between 21st and 23rd August 2017 in Shabran. This dialogue-driven and interactive activity was jointly organised by the Delegation of the European union to Azerbaijan and the the EU NEIGHBOURS east project. During the EuroSchool, fifteen young Azerbaijanis got the opportunity to participate in a series of interactive learning sessions, direct dialogue exercises and social activities to learn more about the European Union and its partnership with Azerbaijan. Six trainers from the country and from the EU oversaw the sessions, which covered a varierty of topics including: the European Union's history, the EU institutions and decision-making, common stereotypes on the EU, the EU's role for sustainable energy and environment, what is means to be European, Erasmus+ in Azerbaijan, and EU-funded opportunities for young Azerbaijanis. To learn more about the 'Young European Neighbours' network and the 'Young European Ambassadors' in Azerbaijan, download the publication here. The YEAs' Meet-Up took place on 19th and 20th July 2017 in Brussels. During these two days, the Young European Ambassadors from the EU and Eastern Partner countries had the opportunity to gain a deeper knowledge of the EU and take part in active discussions ahead of the Eastern Partnership Summit to be held in Brussels in November 2017. The Meet-Up was jointly organised by the European Commission (DG NEAR), the European External Action Service and the EU NEIGHBOURS east project. The event offered the YEAs the chance to get to know each other in person through social activities and visit to the EU institutions, including the European Commission, the Europa building, the European Parliament, and the Estonian Permanent Representation to the EU. They also had the unique opportunity to engage in direct dialogues with high-level EU officials, including HR/VP Federica Mogherini, as well as participate on workshops on how to better communicate about the EU in the Eastern Neighbourhood countries. As a result of their participation, more than 60 YEAs boosted their communication and networking skills, resulting in a strong presence online by using the hashtags #StrongerTogether, #EU4Youth and #YEA. Watch the video of the Young European Ambassadors' Meet-Up! From 8th to 14th May 2017, 15 YEAs participated in events, meetings and visits organised across Armenia. It was organised in cooperation with the EU Delegation to Armenia on the occasion of Europe Days. They organised games and activities to raise awareness about the EU and its partnership with Armenia in Yerevan, Gyumri, Vanadzor and Dilijan. These events featured the participation of senior EU officials and shed light on EU-funded projects in Armenia. In addition, they visited a secondary school (Yerevan School No. 196) and the Yerevan State University to deliver interactive presentations on the European Union, its history and values, EU-Armenia relations and opportunities for young people. Finally, the YEAs met with local stakeholders to discuss potential partnership, including EuroClubs and the European Youth Parliament. Watch the video of the Young European Ambassadors' visit to Armenia! To learn more about the 'Young European Neighbours' network and the 'Young European Ambassadors' in Armenia, download the publication here. Between the 8th November and the 2nd December 2016, twelve ‘Young European Ambassadors’ from the Republic of Moldova and EU Member States visited more than 30 schools, VET colleges and universities in Moldova. They engaged in a peer-to-peer dialogue with over 3,500 young people across the country. This activity was organised jointly by the EU Delegation to the Republic of Moldova and the EU NEIGHBOURS east project within the framework of the ‘Europe for Moldova’ public awareness campaign and in cooperation with the country’s Ministry of Education. The visits consisted of an interactive presentation on the EU, its origins and values, its structure, and its partnership with Moldova. It also introduced pupils and students to EU-funded opportunities in the country, with exchanges of experience on this topic between young Moldovans. Finally, workshops were organised to develop project proposals answering the question: “What would you do in Moldova to improve the life of your community if you were given a grant from the European Union?”. Watch the video of the Young European Ambassadors' visit to the Republic of Moldova! In August 2016, 15 young Azerbaijanis participated in a four-day summer school on the European Union organised in cooperation with the EU Delegation to Azerbaijan. The EuroSchool featured interactive learning sessions about the EU, its history and values, the European Neighbourhood Policy, and the 25 years of Azerbaijan-EU partnership. In addition, it provided a framework to engage in informal discussions on issues relevant to young people: what it means to live in Europe, the EU's role for youth in Europe and in Azerbaijan, and opportunities for young Azerbaijanis (including Erasmus+). Finally, it allowed participants to take part in fun, educational and cultural activities including an excursion in Gabala, questions and answers sessions, as well as games and quizzes on the EU. In addition, participants were introduced to the newly established ‘Young European Ambassadors’ initiative and invited to apply. Watch the video of the EuroSchool 2016! The Young European Neighbours network is an online platform that facilitates the mutual exchange of experience, ideas and information. It also promotes engagement of young people in social action by providing a greater access to EU opportunities. It focuses on people-to-people contact and dialogue-driven activities that will contribute to an enhanced understanding and perception of the EU and a greater appreciation of its relationships with the Eastern Neighbourhood. Join the 'Young European Neighbours' group on Facebook to keep updated with opportunities for youth in the Eastern Neighbourhood! The ‘EU NEIGHBOURS east’ project launched a contest for young people between the ages of 18 and 26 from Armenia, Azerbaijan, Belarus, Georgia, Moldova and Ukraine. Six winners – one from each country – got the opportunity to travel to Poland, while the runners-up won electronic tablets. To take part in the contest, titled #EUaroundU – Tell your story, young people wrote a personal story no longer than 600 words, in English. Participants were invited to highlight the impact that the EU has had on their personal life or community. Topics could cover anything related to the EU, whether EU projects or programmes, educational exchanges, etc. Download the regulation here for more information. The winners of the top prize traveled to Poland for the Eastern Partnership Youth Forum in June 2017, where they joined hundreds of other young people from 39 different countries to network and discuss common challenges. They were selected on the basis of the originality and relevance of their stories. Their stories can be read here.